To help improve the portability and re-usability of test suites and test cases, Test Collab supports exporting and importing the test suites in XML format. With the XML export feature you can get the entire test suite tree i.e. the test suite along with all its children suites and test cases exported from an existing project / instance of Test Collab. Similarly porting the test suite tree from other sources becomes very easy, the sources may be manually maintained test cases or other test case management systems. On Export Options page, select "Export as XML"
You can get an XML file that has the structure similar sample XML provided at bottom and XML Structure section. The exported XML is ready to be imported in any system that supports the format. If you have a suite tree ready to be imported in Test Collab that conforms to the supported structure (please refer the sample xml below and XML Structure section for this) , then you can easily get it imported into project. Make sure that the file you are using for import has the same syntax (Markdown / HTML / Plain text) as the one being used for your Test Collab's instance. Check the size of file that is being uploaded, as the upload limit depends on the PHP settings done on your hosting server. On Test Suites & Cases tab select Import , On Import Options page, select "Import from XML"
On "Import from XML" page you have options of getting the entire tree introduced under a pre-existing suite of current project or you can also opt to get the suite's tree imported at the root level. To select a pre-existing suite either type its name in the given selector, or select it from the tree that's shown when you click "Select from tree". You may leave the suite name empty if you want to import the test cases at the root level. 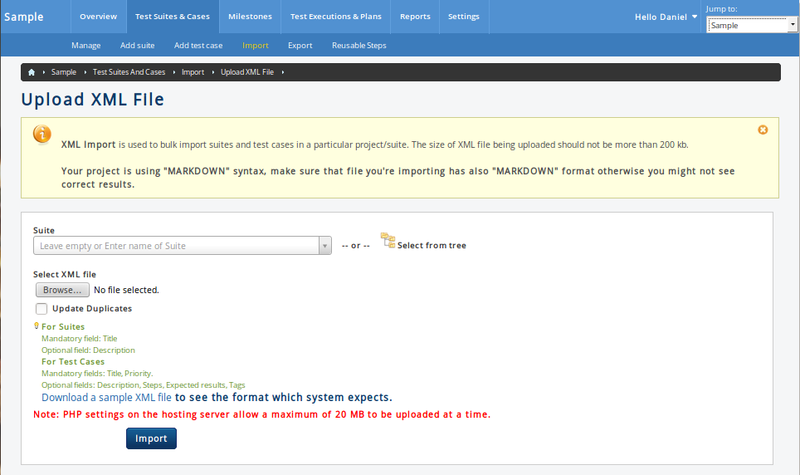 Select the XML file to be uploaded by clicking the relevant box next to "Select XML file". Update Existing - If you are importing some or all suites / cases with titles that have already been introduced in the current project and are at the same level in suites' hierarchy at which you are planning to import them this time, then you can opt to "Update Duplicates", this means that if there is any change in a test case's structure in XML, then that change will be reflected after import. 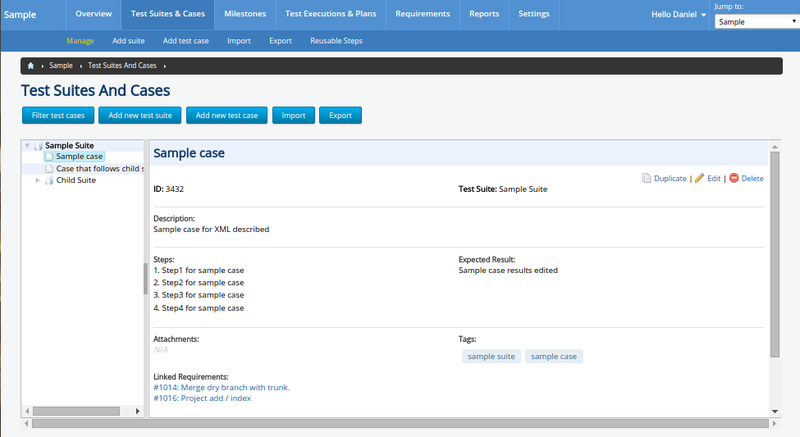 Please note, here the updates will be directly dependent on the test suite's and test case's title. If "Update Duplicates" is not selected and during import it is found that there is a duplication in suite's name, then that suite will simply not be imported at all, because in Test Collab there can only be one suite with a name when it comes to a particular level under a particular test suite (or at root level whatever the case is). After selecting the XML, and setting the other options available on the screen, when you click the "Import" button, you will be redirected to suites manager page, where you can see the imported suite's tree. XML Structure when single text field is used for test case steps. XML Structure when separate text fields are used for test case steps.